JEFFERSON CITY, Mo. – March Madness kicks off next week, showcasing the very best of college basketball. 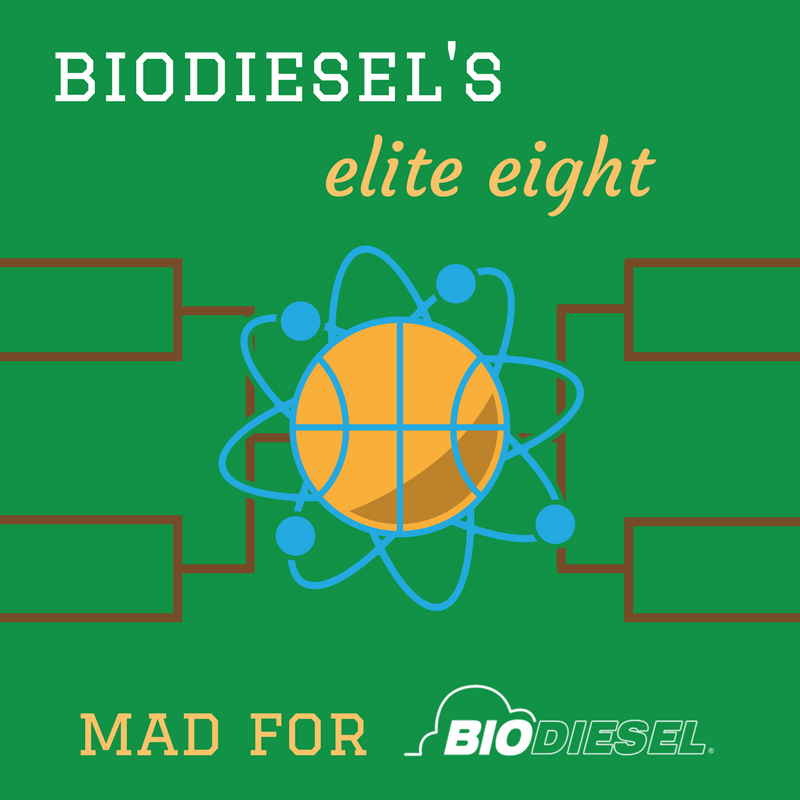 In that spirit, the National Biodiesel Board (NBB) has released its own bracket of colleges and universities upping their game with a different kind of prowess – biodiesel research, production and education. Many of these biodiesel ballers are members of the student group, Next Generation Scientists for Biodiesel (NGSB). Yale University (New Haven, Connecticut): Yale’s basketball team may have had an average year, but when it comes to biodiesel, the Bulldogs are ahead of the game. Campus shuttles use B20 (20 percent biodiesel), and Yale has been exploring green technologies for biodiesel in the Department of Chemical and Environmental Engineering. Graduate researchers in Dr. Julie Zimmerman’s lab have investigated the use of microalgae as a biodiesel feedstock, the use of supercritical carbon dioxide as both an extraction and transesterification solvent for biomass processing and biodiesel conversion, and heterogeneous catalysis in biodiesel conversion, among other projects. Graduate student Mary Kate Mitchell received a travel scholarship and presented her research as a student member of NGSB at the National Biodiesel Conference & Expo earlier this year. Rowan University (Glassboro, New Jersey): A team of undergraduate engineering students is working to develop a process that would reduce the energy consumption needed to obtain oil from a wet microalgae feedstock. This could reduce the cost of the overall extraction process and make it a more economically feasible feedstock for biodiesel. The project, which received recognition at the 2017 National AIChE Conference, is developing a novel lipid extraction method through the use of switchable ionic solvents. Their head coach, Dr. Iman Noshadi, is an NGSB alum and past scholar. North Carolina State University (Raleigh, North Carolina): A maddening basketball loss may have brought March in like a lion for the NC State Wolfpack, but the school’s biodiesel program is a surefire winner. The school has a grease collection program on campus, which local company GreaseCycle turns into commercial biodiesel. Also, it’s where NGSB co-chair Jennifer Greenstein conducts her research developing biocatalysts that are high temperature-tolerant lipase enzymes generated by bacteria, making the enzymes easy to recycle and use in multiple reactions. Loyola University (Chicago, Illinois): The Searle Biodiesel Program’s biodiesel lab is a slam-dunk, producing fuel, BioSoap, windshield wiper fluid from low-purity methanol and lip balm from campus beehives. Certified with the Illinois Green Business Association, the student-run enterprise bills itself as the first and only school operation licensed to sell biodiesel in the United States. Loyola students give it a full-court press, developing a Zero Waste Production Process with current research focused on wastewater treatment with algae. Missouri University of Science and Technology (Rolla, Missouri): The Chemical Engineering Department at MS&T is developing a Multi-tubular Supercritical Separative Reactor (MSSR) to produce biodiesel. The venture started in the classroom with an experimental course, led by Dr. Bonnie Bachman, that simulated a start-up business. Students Shyam Paudel and NGSB Co-Chair James Brizendine were then accepted into an entrepreneurial program at the Technology Development Center in Rolla, Missouri. The program gave an assist, providing funding of more than $50,000 to develop a biodiesel business model and construct a lab-scale MSSR, currently in the testing phase. University of Kansas (Lawrence, Kansas): The basketball team may be pegged as one of the favorites in the tournament, but the KU Biodiesel Initiative is already a champion. The student-run operation produces biodiesel from used cooking oil generated on campus, with the goal of meeting the requirements of KU's buses, landscaping and maintenance equipment, and power generators on campus. Glycerin produced from biodiesel process is repurposed to create a soap product. Additional projects involve testing fuel samples from outside the university, including for the Kansas Department of Transportation. Several students have attended the National Biodiesel Conference & Expo. University of Nevada Reno (Reno, Nevada): As part of a growing Sustainable Dryland Agriculture Initiative, UNR is developing new ways to produce food, forage and fuels from underutilized semi-arid regions. The chemical engineering department is researching advanced conversion methods to optimize biofuel production, including biodiesel, from traditional and dryland crops. In the department of biochemistry and molecular biology, students investigate biodiesel feedstock development in species including camelina, agave, prickly pear, and gumweed. A minor in renewable energy and graduate certificate programs cover emerging alternative energy technologies like these, in addition to the policy and markets that drive bioenergy development. NGSB Co-Chair Jesse Mayer researched methods to increase oil content for biodiesel production from prickly pear cactus (Opuntia). He has attended the National Biodiesel Conference and Expo five times – a student record. University of Idaho (Moscow, Idaho): While the Idaho Vandals men’s basketball team finished second in the Big Sky conference, the school’s biodiesel program is top of the class with an extensive research, development, and education program. The Biological Engineering Department has an advanced biofuel lab of more than 10,000 square feet for biodiesel production, testing and research. The school makes biodiesel on the campus from dining services waste oil and uses it in campus vehicles and equipment. The program educates students through lab tours, senior capstone design projects, the creation of videos and web content, and through participation in the Clean Energy Club. A recipient of the USDA National Biodiesel Education grant, the school maintains a biodiesel education website with hundreds of articles, videos, and educational materials for academia, biodiesel producers, users, policymakers and the public. Clemson University (Clemson, South Carolina): After taking a timeout to focus on startup ventures including an award-winning brewery, NGSB alum David Thornton and Clemson University are teaming up to train facilities personnel and instructors to bring the school’s biodiesel plant back online. On the rebound, the school’s goal is to produce about 3,000 gallons of biodiesel per year from waste vegetable oils on campus, which will displace about 20 percent of the diesel fuel used in campus vehicles. Biosystems Engineering students learn from operating the plant, while a renewable energy course and creative inquiry courses help further the school’s biodiesel education leadership. Several Clemson students have attended the biodiesel conference on scholarships. Even if they don’t play in the actual NCAA tournament, these and many other advanced biofuel programs are true champions to the still-growing biodiesel industry. Made from an increasingly diverse mix of resources such as recycled cooking oil, soybean oil and animal fats, biodiesel is a renewable, clean-burning diesel replacement that can be used in existing diesel engines without modification. It is the nation’s first domestically produced, commercially available advanced biofuel. Based in Jefferson City, Missouri, the National Biodiesel Board is a nonprofit trade association dedicated to coordinating the biodiesel industry and educating the public about the fuel.